Why we love it: The luxury oil of our dreams! 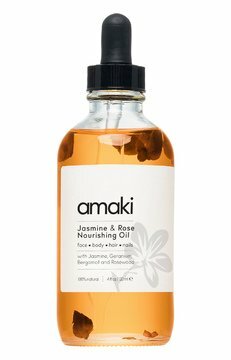 This do-it-all Jasmine and Rose Nourishing oil from Amaki is crafted from organic essential oils that enrich face, body, hair and nails. Lightweight and non-greasy, this elixir of 8 organic oils infuses skin with deep hydration while boosting shine and strength in hair follicles and nails. The intoxicating scent of Jasmine and Rose combined with Sweet Almond makes for a delicious experience! Cruelty free. Safe. No animal products.